New price: $ 1500 - (Dont have a UK price) | S/H price: ?? The spec of the card is very high. 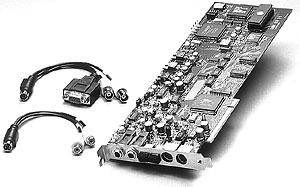 You get 4 balanced analog outputs with high quality 18 bit DA's that can be set at either +4dBu or -10 dBV....& you also get AES/EBU or S/PDIF digital I/O......Also, the Studiocard is a 32 bit PCI bus card, so much better throughput should be expected over ISA based cards....You also get high quality balanced connectors as well. Let's think about that.....Comparing the physical output/input facilities only, if you bought 2 Tahiti's + a DAL Digital Card D, it would set you back about the same amount of money.....and although I haven't heard this card, the spec is higher than a Tahiti....more around the Pinnacle/DAL level...which are more expensive....So it would seem to be a good deal....but now we have stuff like the Event Cards coming out, there is really no way these type of prices can be considered reasonable if Antex are expecting to crack the music market as a name product....(regardless of the quality !!) .....I'd say it should be more around the 900 - 1K mark with features such as this card has....There is competition now from the Korg 12/12 IO, and the Event Layla to name but two. I'll have to check back with the distributors again to see if there's a price cut due....Probably this card is aimed more at professional mutimedia & video type applications, with features like code generation etc.....But, If you are seeking a high quality proffesionally spec'd card for your work, then give this 'Studiocard' a look.... The features certainly seem impressive ! windows95/NT music/sound software on the market. any of the rest. Hard to believe but its true. the site and check it out. This is the flat out best card you could ever want for the PC using NT. I am not a spokes-person for them, nor do I get anything for saying this. I have been lucky enough to buy a few for my company and have had the wonderfull expierience of using them. They have the capability of stacking 4 of their cards together to give you 12 audio devices. Ask for Dave Antrim and tell him that Jeff with Activate sent you. He will probably cut you a deal. i have to admit that your assesment of this card is correct, $1500 + is too much for the abilities of this card. Someone would be better off with a MOTU 2408 and you would pay a lot less money for somthing that does considerably more.